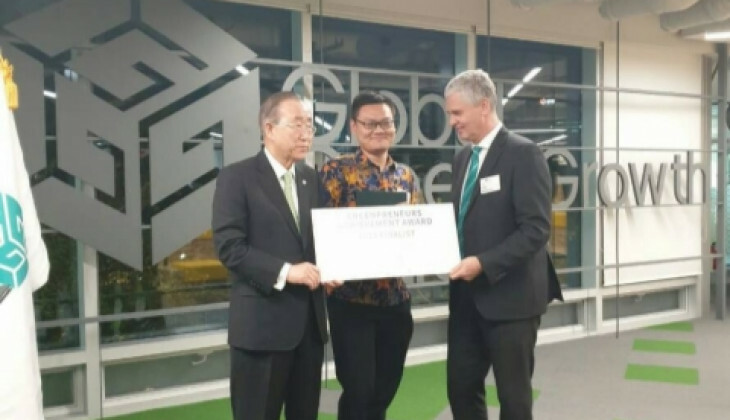 An UGM team consisting of five students has won Greenpreneur Competition 2018 organised by Global Green Growth Institute (GGGI) in Seoul, South Korea, from 29 October - 2 November 2018. They were entitled to receive awards in funds worth USD5,000 after presenting their business idea that was environmentally friendly. “The UGM team went through to the finals in Korea and earned funding along with teams from Uganda, Cambodia, and Morocco. We were invited to Korea for a business pitching in front of GGGI leaders,” said Yohanes Susanto, team member. Yohanes said as many as 200 teams joined the competition on environmentally friendly business. Of all the participants, as many as 10 finalists were selected and 4 best teams were invited to do pitching in Seoul. In the competition, the students designed a business production in organic pesticides. The UGM students consisted of Yohanes, Jonathan Kent Sorensen, Muhammad Hafish Mahdi, Albertus Alphero Tangkilisan, Natali Gupita Abhirama, and supervised by Dr. Wiratni Budhijanto. “We made the organic pesticide products that are more resilient to rains than regular pesticides. The raw materials are obtained from the distillation of local providers that failed to be sold,” he explained. The participants also had the opportunity to learn strategies to develop businesses through mentoring from experts who had been appointed by GGGI. “What makes this competition different is the running of a ten-week mentoring by GGGI on how to do marketing and starting a business. In addition, each week we have to resolve a task and submit it, which includes market surveys, financial planning, and social and economic impact analysis,” said Yohanes. Now with this knowledge from the competition, the students are able to prepare steps for starting and developing the business that can give economic and benefit as well as positive impacts on the environment.